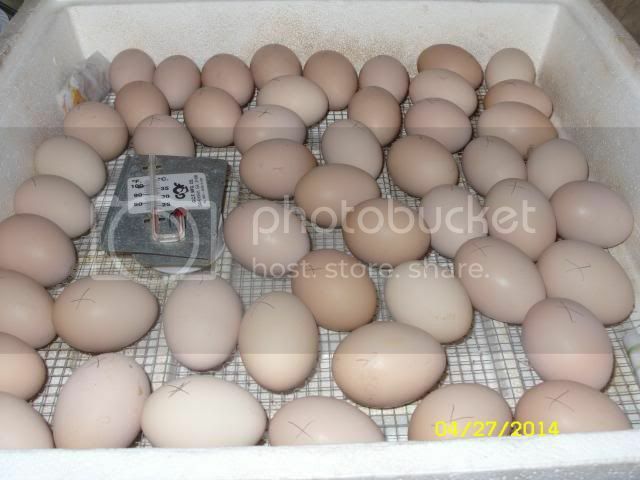 It has been over 10 years since I have hatched eggs out in the incubator. I have chicks coming May 19th, so decided to see if I could hatch some of our eggs to go with these chicks. So about 10 days ago I started saving the eggs that I brought in from the hen house. I put the eggs in egg cartons with one end propped up on my counter. Twice a day I switched the ends that were propped to keep the yoke from sticking to the shell. Last week I cleaned up one of our incubators. I left it out in the sun for a day to kind of sterilize it. Then Friday I plugged it in and started adjusting the temperature. I set the eggs on Sunday evening. So far so good. I hope to figure out a way to candle them in 10 days. I thought I had a candler, but can't seem to find it. I am trying to keep the temperature at 100* since I don't have a forced air fan for it. A little bit about the incubator. We actually have 3 incubators. We have 2 Hova-Bators and 1 Little Giant. The Hova-Bators use a wafer for the thermostat. The Little Giant is all electronic. I really dislike the Little Giant. I have never had a great hatch in it. I have had some great hatches in the Hova-Bators. A good hatch is 50% to 60% according to the experts. I have actually had 80% and 90% hatches in these 2 Hova-Bators. I even hatched goose eggs in one of them once. Supposedly that is impossible because the heating element is too close to the eggs. I just put 4 eggs in and turned them several times a day. We had a 50% hatch, but lost one later. Jade, the goose, lived a long happy life. Over the years, I have hatched many chickens, ducks, geese, turkeys, pheasant, quail, guineas, and chukkar. 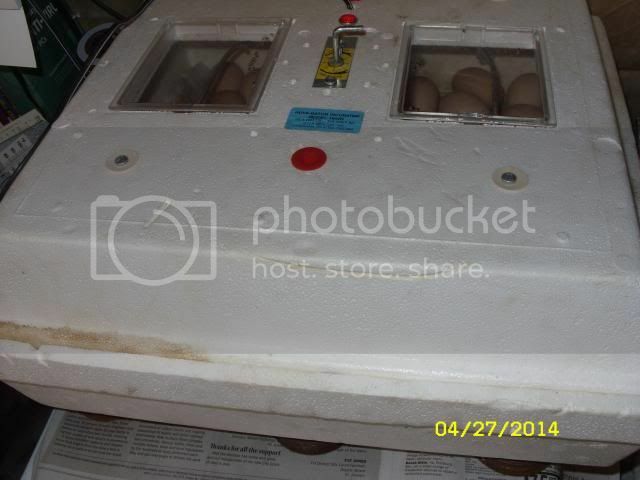 These incubators have been used hard, but not for at least 10 years. Not sure if I will have a good hatch after all these years, but giving it a try. I will try to update this post as I go along. I am turning them every 8 hours I turn at 7 a.m., 3 p.m., and 11 p.m. Working so far. My biggest problem has always been keeping the humidity correct. This time, I not only filled the tray with water, but folded up 2 paper towels into little squares and have them in the corners. I keep these wet. I have a little squirt bottle for wetting them down. I have 50 eggs in here. If I really get back into this, I may get an automatic egg turner some day. That's great that you are hatching eggs again. I bet you've missed it, it's so cool to see them come out of their shells! One thing I have found that really helps with the humidity is to put a maxi pad in the bottom and pour water on it. It will hold a lot of water and will keep the humidity up. Good luck with your hatch, looking forward to seeing some pics. Have fun with your hatching, Winona! We haven't done it the past few years but will be hatching our meat birds in June/July. The farmer who is raising them from us has to be out of town during that time so doesn't want to start them prior to that, but suggested that if we hatched them they'd be ready 3 weeks sooner than if she sets them after she gets home. So, we will be going for it, probably with both her incubator and ours.